One and two: Can “take one” or “take two”. Start to see one-to-one correspondence. These ideas are in order of complexity. Start with the easy ones at the top of the list!! Count – practice saying numbers in order. At first, this is just rote memorization – they don’t really understand the meaning of numbers yet. Teach one to one correspondence by having them count objects. There’s lots of great tips at www.wonderbaby.org/articles/just-one, like give child a muffin tin with 6 cups, and six objects – encourage them to put just one in each hole. Then an egg carton and 12 objects. Then set the table, setting out snacks on plates… I also really like the book Old MacDonald’s Farm (Poke-A-Dot!). It’s a counting book with little plastic dots that they “pop” as they count them. Read counting books. (I list some favorites here.) Play “what comes next” – so when you’re on the page with five puppies, ask them to guess how many puppies will be on the next page. Don’t always start at one. When you’re on the fifth stair, say five, then six, then seven. Help them realize that two means the same thing whether you’re talking about two dogs, two shoes, two crackers, or two toys. Show how even if you re-arrange things to take up more space, it’s still the same number: Line up three toys and count them. Then make a triangle shape and count them. It’s still 3! You can count objects in any order and you still get the same sum total objects. Counting on – after they’ve counted three blocks, give them two more, and encourage them to say “four, five” rather than starting all over from the beginning. After age 4 or so, play any board game that works on the principle of roll your dice and move your piece that many spaces. Add scoring to any physical play game – when you make a basket, it’s one point. Once they’ve mastered that, then do something like if you get a rock in the blue square it’s 2 points, red square is 5 points, yellow square is 10 points. As they get older, encourage them to estimate first, then count. Estimating is tricky for kids! Adding and subtracting: first work a lot with “more” and “less.” When you put one more in a pile, you added, and you have more. When you take one away, you subtracted and you have less. Play with number lines. Different combinations of numbers can yield the same sum. 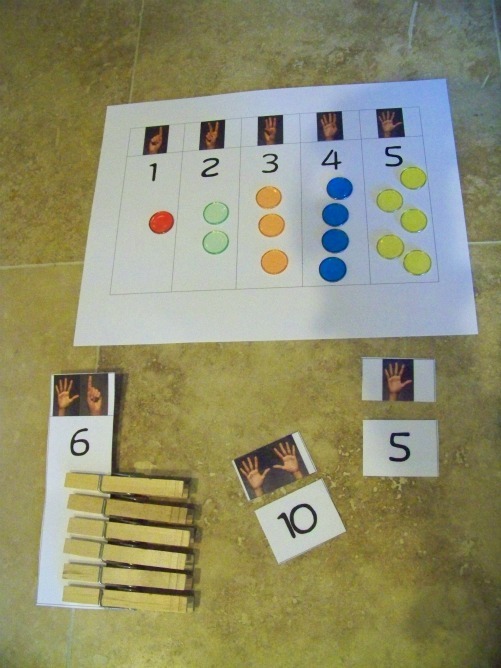 By age 5 or 6, start working with place value: 1’s, 10’s, 100’s. Some math manipulables can help with that, such as Unifix Cubes , Base Ten Blocks and Cuisenaire Rods. Click here to read more about teaching math to kids. Image credit: from http://creativeprek.webs.com/mathcenter.htm, marked as free to use.